B. Wayne Hughes' Spendthrift Farm in Lexington, Ky., has announced a major addition to its roster of stallions (story on BloodHorse.com). The farm, which currently stands four studs, will add a trio of newcomers for the 2009 Thoroughbred breeding season. Into Mischief (pedigree), a son of Harlan's Holiday (SRO) from the Storm Cat (SRO) sire line, was a juvenile grade I winner for Spendthrift's B. Wayne Hughes. 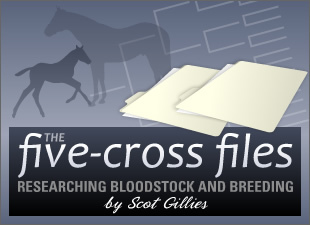 His female family is one of distinguished runners, including Tim Tam and Affirmed and Fleet Nasrullah and Chief's Crown and Winning Colors -- and if we look further back, we find excellent sires Discovery and Bunty Lawless. Notional (pedigree), a son of the well-regarded Caro (IRE)-line California sire In Excess (IRE) (SRO), won graded stakes at one mile and at 8.5 furlongs. Notional's pedigree is a good outcross to most mares he'll find in Kentucky. He has an unusual 4 x 4 inbreeding to the mare La Morlaye, his fourth dam, who is from the "sire-making" Thoroughbred family 13-c -- this line makes Notional a relative (albeit distantly) of Mr. Prospector and Seattle Slew. And Notional's broodmare sire is a son of Deputy Minister -- another piece of the puzzle when it comes to producing a successful stallion. Tiz Wonderful (pedigree), from the immensely popular Tiznow (SRO), should himself prove to be a popular incoming sire in 2009. The colt won the grade II Kentucky Jockey Club Stakes at 2, but has been sidelined for a full year after only a short 3-year-old campaign. Tiz Wonderful has the "big three" in his pedigree: Northern Dancer is 5 x 5 x 5; Seattle Slew is the sire of Tiznow's broodmare sire; and Mr. Prospector is the colt's second damsire. Add that to his own In Reality-line descent and it's clear that Tiz Wonderful won't serve as an outcross to most mares, but will instead offer many opportunities to inbreed to successful lines. Tiz Wonderful is the first foal of his dam, the family 16-h mare Evil. I'm excited to see the variety of bloodlines being introduced by Spendthrift this year and look forward to seeing what types of mares the farm seeks for its new studs. The prospects for Notional are especially interesting, and I'd like to see him crossed with daughters of Devil's Bag or Devil His Due (SRO), who've fared well with Notional's sire, In Excess. In Excess also showed an affinity for mares by Conquistador Cielo, which might be more easily found in Kentucky than in California, and should therefore present a good opportunity. Daughters of Marquetry (SRO) -- a son of Conquistador Cielo out of a daughter of Vice Regent (sire of Deputy Minister) -- might make an especially astute cross with Notional.